The stronghold of Deephall was once home to a thriving, peaceful community, but now, the mountain city lies under constant threat of invasion. A horde of undead, led by dark priests, attacks Deephall constantly. These unending attacks deplete the city’s guards and erode the peoples’ resolve. Four heroes are all that stands between Deephall and the city’s extinction. 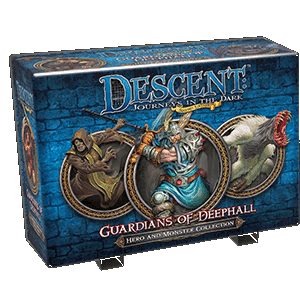 Guardians of Deephall is the fourth Hero and Monster Collection for Descent: Journeys in the Dark Second Edition. It was first announced on 7. July 2014, and released on 28. January 2015. This is the first Hero and Monster Collection set to mess with the archetype balance of the included heroes, with two Warriors and no Mages. All the cards and sheets found in this expansion are marked with the Guardians of Deephall expansion icon to distinguish these components from those found in the base game. This page was last modified on 6 March 2018, at 17:45.